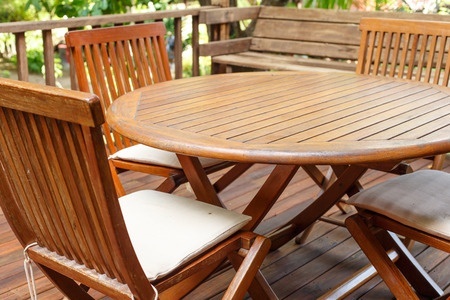 Regular patio furniture cleaning is essential to keeping it looking its best, season after season. But with the various furniture materials out there - from vinyl, wood, and wrought iron to teak and beyond - sometime's it's hard to figure out how to safely clean each piece. Keeping patio furniture clean can be a challenge. You wipe off the dirt and grime, your patio furniture dries, and streaks or worse appear. The same challenges arise on most outdoor pieces - you're battling Mother Nature here, after all! Here are some dirty little secrets to mastering the art of patio furniture cleaning, and some of the best products and tools around to help you do just that! Patio furniture tables are really hard to clean flat. The trick to cleaning a patio table is to turn it on its side, and hose it down first. Find more details on patio furniture cleaning.